Azure Stack is an extension of Azure, bringing the agility and fast-paced innovation of cloud computing to on-premises environments. With the great power of Azure in your own datacenter, comes the responsibility of operating the cloud – Azure Stack. At the Microsoft 2016 Ignite conference, we announced a set of Modern IT Pro job roles for the cloud era and resources to help organizations to transition to cloud. This year, with a more focused effort in accelerating customer’s readiness for Azure, we’ve published a set of Azure Learning Paths for Azure Administrator, Azure Solution Architect, Node.js Developer on Azure, and .NET Developer on Azure. Associated with each learning path, there is also a set of free online-based self-paced courses to assist you quickly pick up the skills you need to make an impact on the chosen job function. 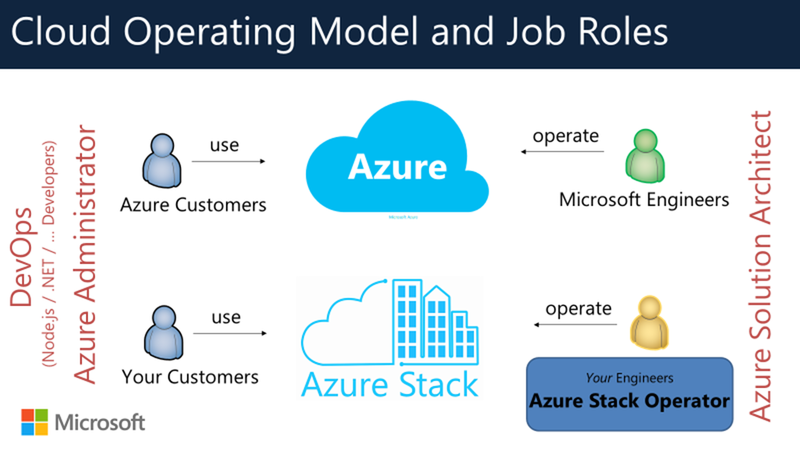 With the introduction of Azure Stack, we’re adding a new Azure job role – Azure Stack Operator. This is the role who will manage the physical infrastructure of Azure Stack environments. 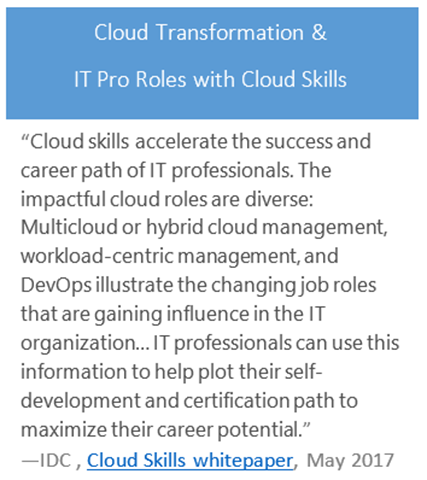 Unlike Azure, where the operators of the cloud environment are Microsoft employees, in Azure Stack, organizations will need to have people with the right skills to run and operate their cloud environment. If you haven’t yet, read the Operating Azure Stack blog post to see what tasks this new role will need to master. Azure Stack Operator: Responsible for operating Azure Stack infrastructure end-to-end – planning, deployment and integration, packaging and offering cloud resources and requested services on the infrastructure. Azure Solution Architect: Oversees the cloud computing strategy, including adoption plans, multi-cloud and hybrid cloud strategy, application design, and management and monitoring. Azure Administrator: Responsible for managing the tenant segment of the cloud (whether public, hosted, or hybrid) and providing resources and tools to meet their customers’ requirements. DevOps: Responsible for operationalizing the development of line-of-business apps leveraging cloud resources, cloud platforms, and DevOps practices – infrastructure as code, continuous integration, continuous development, information management, etc. In the above graph, the light-brown colored role names (Azure Solution Architect, Azure Administrator, and DevOps) are applicable to both Azure and Azure Stack environments. The role in blue box, Azure Stack Operator, is specially designed for Azure Stack. “Your Customers” encompasses two groups of Azure Stack users: one group is the Azure Admin, who manages subscriptions, plans, offers, etc. in your Azure Stack environment, and the other group is the tenant users of the cloud resources presented by Azure Stack. The tenant users can be DevOps users who either develop or operate the line-of-business applications hosted on an Azure Stack cloud environment. They can also be the tenant users of a service provider or an enterprise, accessing the customer applications hosted on Azure Stack. We are in the process of developing a 5-day in-classroom training course – “Configuring and Operating a Hybrid Cloud with Microsoft Azure Stack”. This course is currently scheduled to be published in September 2017. If you want to know more about this exciting new job role, Azure Stack Operator, along with other Azure Stack related roles and their corresponding learning programs, come to Ignite 2017 and attend the theater session “THR2017 - Azure Stack Role Guide and Certifications”. At Microsoft Ignite this year in Orlando we will have a series of sessions that will educate you on all aspects of Azure Stack. Be sure to review the planned sessions and register your spot today. The Azure Stack team is extremely customer focused and we are always looking for new customers to talk too. If you are passionate about Hybrid Cloud and want to talk with team building Azure Stack at Ignite please sign up for our customer meetup. If you have already registered for Microsoft Ignite but haven’t yet registered for the Azure Stack pre-day, you can add the pre-day to your activity list. And if you are still planning to register for Microsoft Ignite, now is the time to do so, the conference is filling up fast!